The picture says it all. Anna Tunnicliffe and her team went into the Olympics with every hope of scoring a gold medal. Instead they were defeated by their training friends from Finland in the quarter finals. The United States has finished its quest for sailing medals in the 2012 London Olympics without success, for the first time since 1936. 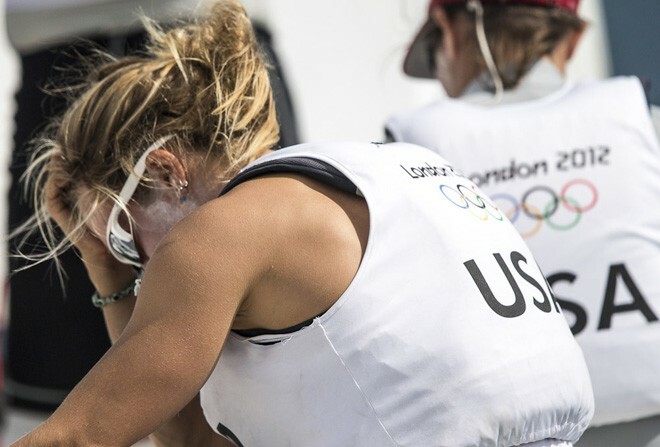 The last of the US sailors to still be in the medal chase, Women’s Match Racing skipper Anna Tunnicliffe, was beaten in the quarter finals by Finland on Wednesday. A clearly upset Dean Brenner, the outgoing chairman of the U.S. Olympic Sailing Program, said ‘this is not the distinction this team was going for. ‘There is no hiding the results. There is no way to spin it. There is no way to suggest anything other than we didn’t perform. There is going to be an enormous amount of discussion. ‘A lot of it is going to be productive and some of it probably won’t be. Discussion on what we did wrong and what we could do better and I am going to leave that with my successor Josh Adams and we are going to look very closely at our program.